If It's Too Loud...: Salem Wolves - "Teenage Wonder"
Salem Wolves - "Teenage Wonder"
Salem, MA's Salem Wolves are back with another single, "Teenage Wonder." This one is a pretty straightforward rock n roll anthem with heavy punk elements. It feels like a song that would have been played at The Rat in Boston any time in the early 80s. You get the sense of breakneck ferocity even though the song never quite rips it out that heavily. We might be a little late posting this since a press release describes it as "... the soundtrack to a stoned-and-sunburned summer night." Oops. Hey, the end of the summer gets busy! You can listen to "Teenage Wonder" below. 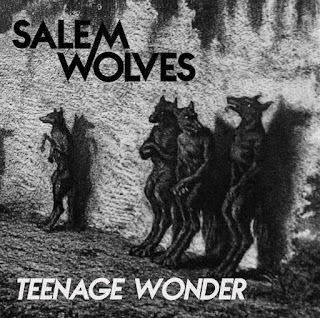 Also, be sure to check out Salem Wolves' website for more info (including tour dates), and their Bandcamp for more releases. Rose McDowall - "Cut With the Cake Knife"
Shovels & Rope - "Hush Little Rocker"
David Wax Museum - "Young Man"
The Dead Milkmen and F.O.D. Release a Split 7"